Right: painting of Valliyūr Vēlāndi Tambirān Swāmi. Left: Valliyur Subramaniyar Swāmi Kovil. Saravanapoikai Tank, Valliyur Subramaniyar Swāmi Kovil. 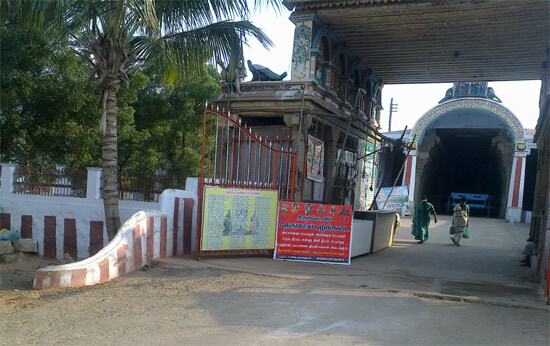 This ancient Murugan temple is located at Valliyur, near Nanguneri, not far from Tirunelveli and Kanyakumari. Valliyoor is located on the Kashi-Kanyakumari highway, it is at 30 milestones from Tirunelveli and 60 kms from Tiruchendur. The Valliyoor Murugan temple is located in close proximity to the Valliyoor railway station. It has been revered by the Tiruppukazh hymns of Arunagirinathar. The presiding deity here is Subramaniyar, and the sanctum enshrines an image of Murugan with that of his consort Valli. 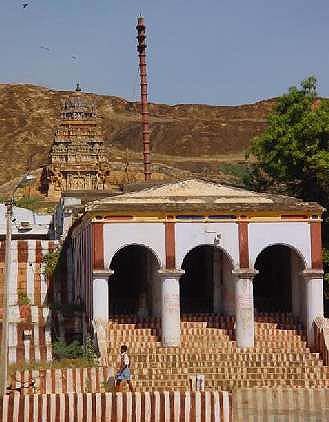 The temple has a rock-cut sanctum carved out of a hill and several mandapams surrounding it. There are also shrines to Natarajar and Dakshinamūrti here. 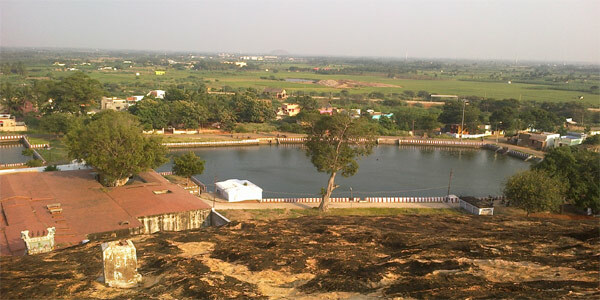 The Saravanapoikai tank is located adjacent to the hill. The diamond studded Vel held by Subramaniyar is of great beauty. Lord Muruga came to Valliyoor immediately after marrying Valli. References are indicated in the Kandapuran. Valli was so much in love with Lord Muruga that she refused to allow Deivanai in her domain. Deivanai was almost in tears and it was only sage Agastya who consoled Deivanai and took her to Valli and explained to her that Deivanai be treated like her sister. As this place belonged to Valli who seems to have had a dominating nature, it is not surprising that women born in Valliyoor are said to be extremely demanding wives after their marriage. They are also extra sensitive. Not a surprise - because it appears Lord Muruga simply pampered Valli! Legend has it that Indra and Agastyar worshipped Subramanyar here. Legend also has it that the Saravanapoikai tank was created when Murugan struck his spear to the ground, upon being requested by his consort. No one has ever returned empty-handed from the Valliyoor Murugan temple. Childless couples have visited Valliyoor, prayed and have come back to pay their respects after their wish was fulfilled by Lord Muruga. Valliyoor Murugan looks at you and says – “Yamirukka Bhayamen” (Why fear when I am here) and that sums up the power of this shrine which is located amidst picturesque Mahendragiri hills. Lord Muruga is someone who rushes to your rescue provided you remember him. So, what are you waiting for? Giri pradakshinam is considered to be of importance here as in Tiruvannamalai, Kunnakkudi and Palani. Seven worship services are carried out each day. Skanda Sasti is celebrated with great splendour here as are the float festival in the month of Karttikai and the annual festival in the month of Chittirai. Valliyoor can be reached from Bangalore, Chennai, Madurai,Mumbai. Nearest Railway Stations are Tirunelveli Junction / Kovilpatti/ Vanchi Maniyachi. Tirunelveli is however the closest railway station. Valliyoor is a one hour drive from Tirunelveli. Nagercoil and Thiruvananthapuram are also located close to Valliyoor. Valliyoor has a railway station too. Some trains do halt at Valliyoor (like the Kanyakumari Express). Bus facilities are aplenty to reach Valliyoor from Nagercoil / Tirunelveli. Donavur and Yerwadi are other tiny hamlets located close to Valliyoor where there is a predominant Muslim population. The once tiny hamlet has grown exponentially over the last few years to become a town. It is famous for the Murugan temple. The population is a mix of Hindus, Muslims and Christians. The Tamil Brahmin community formed a sizeable part of the population in Valliyoor in the early 60’s and 70’s. Today, the percentage of Brahmins in Valliyoor is less than 1%. Valli is the consort of Lord Muruga and Oor in Tamil means village. So, Valliyoor = Valli + Oor ; the village of Valli. What is so special about Valliyoor? The breathtaking scenic beauty, the hills of Valliyoor, the temple of Lord Muruga (also called Lord Karthikeya) which is located in a cave under the hill. The temples of Muppandal Esakki Amman (a village deity that is very powerful) as well as Lord Sundara Venkatesa Perumal (Lord Balaji) are other well-known temples. In recent years, the Mutharamman temple has been re-constructed by way of suitable modifications. All these shrines are the pride of Valliyoor. More importantly, this writer was born in Valliyoor ! Mahendragiri Hill that finds mention in Sundara-Kandam is located to the west of Valliyoor. This was the hill where Sage Parasurama did severe penance. The Valliyoor lake is called as “Cheevalaperi lake”.Well known poet-saint Arunagirinathar has written about Valliyoor in Thirupukkazh”. Keezhakallur Mu. Azhvarapillai (1839-1925) has sung about Valliyoor in his verses. These verses were published by the temple authorities in the year 1942. Village lore has it that Sage Agastya had cursed a merchant called Durlaban in Valliyoor when he refused to part with a few morsels of rice saying that he can’t give anything in charity, even if it was for Sage Agastya. The sage cursed that all the rice that couldn’t be of use to someone like him, be as well converted to stone. This is how the hills were formed. Between the years 1162-1173, Valliyoor was the capital of Pandiya Kings. It is located fairly close to Sri Lanka. Invasion of Muslim rulers around B C 1310 appears to have destroyed many valuable historical records. In the year 1955, electricity connection was given to the temple. Though Valliyoor is synonymous with Murugan temple, requests have been made for archaeological survey in the areas in and around Valliyoor. It is widely believed that Valliyoor palace and fort were destroyed by invaders. In the entire Tirunelveli district, Valliyoor has the rare distinction of having the one and only cave temple of Lord Muruga. A rock named as Pooranagiri was excavated to build this temple. The temple shape is in the form of “Om”. 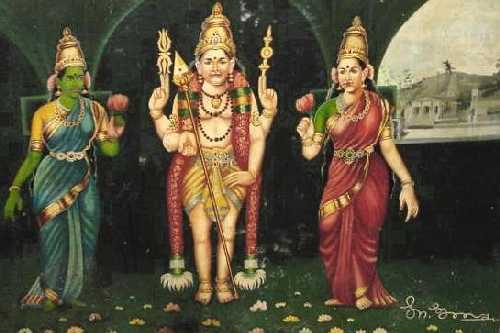 Lord Muruga stands in the sanctum sanctorum accompanied by his consorts Valli and Deivanai. 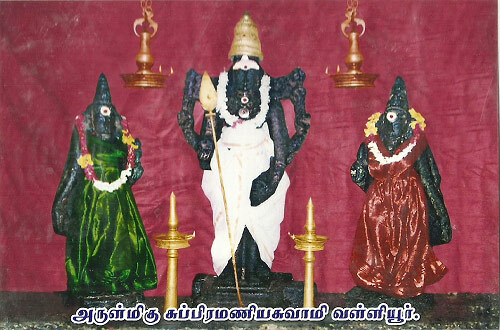 Note that Lord Muruga has four arms and the idol is a replica of the one in Tiruchendur. On his right hand are flowers and his left hand is holding onto his thigh. Next to the sanctum sanctorum is located the artha mandapam and then the maha mandapam. In the artha mandapam, Lord Arumuga gives darshan along with Valli – Deivanai. To facilitate circumambulation of the artha mandapam, the hill has been drilled to set up a cave path till the sanctum sanctorum of Lord Shiva. In this temple, Lord Shiva is called as – Jayandeeswarar. The shiva ling faces the west in this temple which is considered very auspicious. Opposite Lord Muruga is placed the idol of peacock which is Lord Muruga’s vehicle (vaganam). The artha mandapam also has the idols of Vinayaka, Veerabahu and Veera Mahendran. 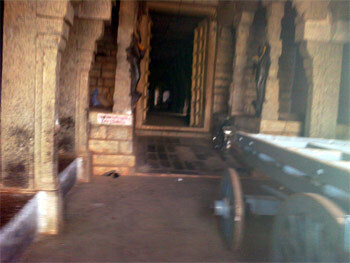 On the right side of the artha mandapam is a cave. Alongside the entrance of the cave are Vinayaka, sastha (ayyappa) and Lord Shiva. The Murugan temple has 13th century stone carvings. The temple also has a specific sanctum sanctorum dedicate to Valli – consort of Lord Muruga. The maha mandapam has kashi vishwanadhar, visalakshi and shani bhagwan. There is also Dakshinamurthy (Guru Bhagavan) idol in the temple. 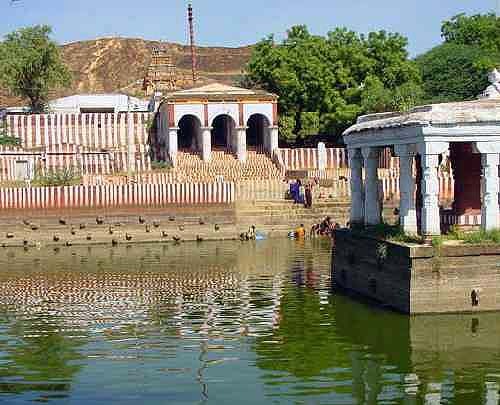 Legend has it that this temple was first discovered by a Pandya king who came here on a hunting expedition after visiting the Perumal temple at Tirukkurunkudi and that the temple was expanded by his descendents. Valliyur was under the governance of Kulasekhara Pandyan of 13th century, who fortified the village. The pond/lake in Valliyoor is breathtakingly beautiful and it is referred as “Saravana poigai”. Legend has it that Lord Muruga created this pond with the help of his weapon – the inimitable “vel” when Valli requested him for the same. During festive occasions, the Valliyoor Murugan temple has its own charm and the entire village rallies around the temple to take part in the festivities. The temple history and other religious books are available in the temple itself. But all these are Tamil books. Photographs are available at a price of Rs.20/-. Rose water is available at the temple counter. All the pooja items are available at the temple entrance itself. Abhishekams are performed in the temple for Rs.2/-. If this does not make your heart melt, nothing else can. People of Valliyoor are naive, almost child-like in their innocence. Unlike other places, you won’t find people in the temple hankering after money. Believe me, the cave temple is a rare visual feat which you must visit at least once. Archaeological surveys in and around Valliyoor have discovered hidden Shiva temples in and around the Nambi river as well as a few sastha temples that were not maintained so well. Some of the idols that were found were supposedly 3000 years old. Chitra Vishu (April 14), Chitra Pournami (May 6), Vasantham (Spring) festival, Adi Amavasya, Pongal, Makara Sankaranthi, Mahashivarathri. During the celebrated Karttik month, lamps are lighted in the adjoining hills. The popular soora-samhara festival is also celebrated with pomp in Valliyoor. Soora-samhara is an important event during which Lord Muruga decimates all his enemies. (Soora – evil, Samhara – Kill). Every day at 7:30 am in the morning, abhishekams are performed for Lord Muruga.  On special occasions like Sasthi, Lord Muruga and his consorts are decorated with flowers and clothes and a procession is taken in silver peacock vehicles.